1. Layer top fabric of choice over 1) a layer of thin soft batting for a mini quilt or 2) a stiff, thick interfacing (Trimtex or Peltex) for a fabric postcard. Add a backing fabric of choice , wrong sides together to Trimtex or batting. 2. Quilt all three layers together with meander or quilting stitches of any kind. The quilting can be utilitarian or decorative and any kind or color of threads can be used. 3. Cut into 1" sized squares for 'inchies', 1 and 1/2" sized squares for 'super inchies', or 2 " squares for 'mega sized' inchies. 4. Serge or embroider around edges to finish all raw edges of this three layer 'inchie'. 5. Use 'inchies' as either artistic trading squares, as a decorative element to add to fabric postcards, or on quilts, or to create.... as I am.... fabric postcard 'quiltlets'or mini blocks for my Alzheimer's Art Quilt Initiative Project. Printed fabric that I used to quilt over thin fleece batting and a backing fabric. I then used meander stitching to quilt all three layers together. Using a rotary cutter and a mat, I then cut the quilted fabric into mega 'inches'. I used a fabric that just happened to come with a squared design on it, as an easy way to learn the process. Any kind of fabric can be used, in any print, in any style, even plain fabric can be used and decorated. Keep up the good work and may your thread never break or tangle! Oh my goodness - you got a comment from Ami Simms! Wow. 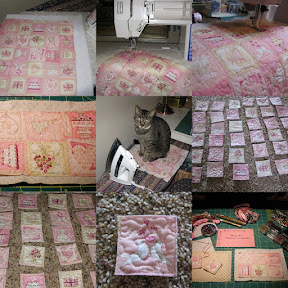 And you can be on record for submitting the smallest quilts! I have seen these inches being traded, but wondered what you would possibly do with them. I hadn't thought of adding them to fabric postcards. That sounds like a wonderful idea to use them for embellishments. wow amisimms!!! see you are so gifted!!!! and yes wonderful idea...fabric postcards, and smallest quilts...embellishments...talent!!!! These are fantastic, what a great idea, "inchies".